FANTOM is an international research consortium established by Dr. Hayashizaki and his colleagues in 2000 to assign functional annotations to the full-length cDNAs that were collected during the Mouse Encyclopedia Project at RIKEN. 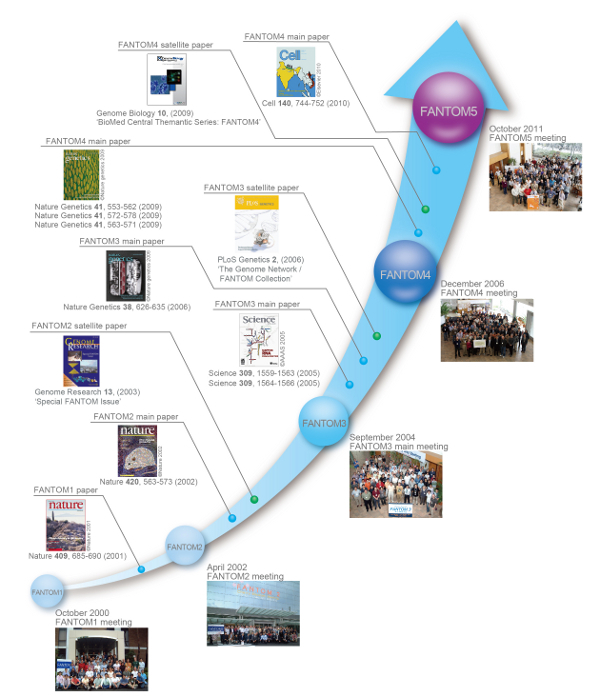 FANTOM has since developed and expanded over time to encompass the fields of transcriptome analysis. The object of the project is moving steadily up the layers in the system of life, progressing thus from an understanding of the ‘elements’ - the transcripts - to an understanding of the ‘system’ - the transcriptional regulatory network, in other words the ‘system’ of an individual life form. Simultaneously with producing data, FANTOM established the FANTOM database and the FANTOM full-length cDNA clone bank, which are available worldwide. The FANTOM resources have been used in several important research projects. For instance, the full-length cDNA database was used in a computer prediction of the genomic position (transcriptional unit) of genes by the International Human Genome Sequencing Consortium. Also they have been used by a research group led by Dr. Shinya Yamanaka at Kyoto University, Japan, for establishing Induced pluripotent stem (iPS) cells. In the study, 24 transcription factors were selected from FANTOM database as candidate initiation factors. Furthermore, the Allen Institute for Brain Science in the United State has created a digital atlas that encompasses the whole brain, and has made it publicly available. The atlas graphically illustrates the expression of genes within the mouse brain using Informatix software. This project has also made use of the FANTOM database.